The city of Stevens Point seems to be on a course to reprioritize construction projects on two of its major arteries. The city has spent over a year evaluating design options for the Division/Church corridor in order to come up with a configuration which best balances the needs of all road users. The final design is expected to be implemented when the city reconstructs the corridor. About a month ago, the city indicated at a Board of Public Works meeting that they are looking at options for building either an overpass or underpass on Hoover Ave to eliminate the at-grade crossing of the railroad tracks just north of the intersection with Industrial Park Dr. At that meeting, the city suggested that they might prefer completing the Hoover project first, thereby postponing groundbreaking on the Division/Church project for several years. Each project provides an opportunity for creating quality bicycle accommodations. This possible shift in city priorities heralds a likely change in where to focus advocacy efforts for improving bicycling in Stevens Point. 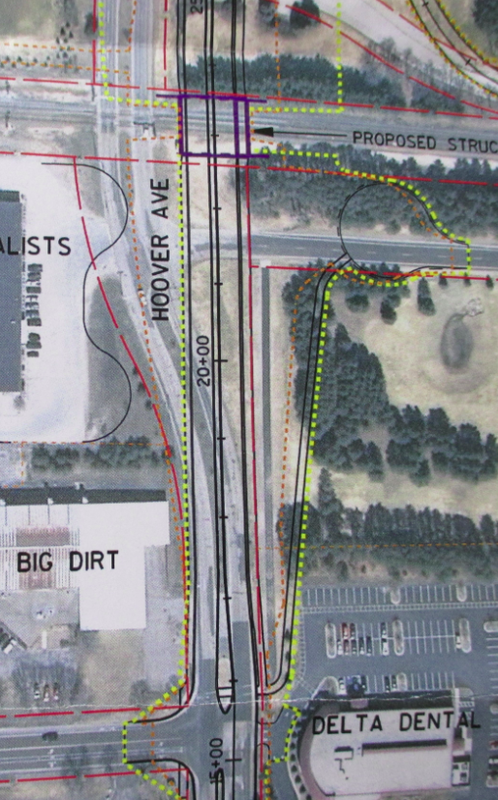 Information about the Hoover project was presented at a public meeting on Tuesday May 6. A summary of what came to light at Tuesday’s meeting appears below. The decision process on how to proceed with the Division/Church project and whether to shift priorities to the Hoover project will move forward at the Board of Public Works meeting on Monday May 12. The agenda for the Board of Public Works meeting can be accessed from this link to the City of Stevens Point website. In a few days, I will probably write a PPSP blog post giving context for the key agenda items listed for this Board of Public Works meeting. An aerial view of the Hoover project area photographed from a meeting handout. The railroad tracks run horizontally near the top. Industrial Park Dr is at the bottom. Hoover currently bends towards the west just south of the tracks, but the proposed alignment (black vertical lines) will go straight across the tracks before bending west to align with Country Club Dr. Joerns Dr is just south of the tracks to the right. The proposal eliminates access to Joerns from Hoover and creates a cul-de-sac (black circle). Joerns provides access to the bike/walk underpass of I-39 east of this location. I arrived late to the May 6 public meeting, so I missed the first portion of the presentation. (I was performing bike/ped traffic counts for Portage County, preventing me from leaving earlier for my ride across town – into a 20 MPH headwind – to the meeting site.) I had seen the presentation at the April 14 Board of Public Works meeting describing the Hoover project, and my impression is that the presentation on May 6 covered the same material. The current railroad crossing on Hoover is problematic because of the long delays caused by significant train traffic coupled with the associated switching operations at the nearby railyard. To make traffic flow more smoothly on Hoover, the city is evaluating options for building either an overpass or an underpass to eliminate the at-grade crossing. Each of these options can be constructed using either retaining walls or sloped ground. Retaining walls are more expensive to build but require less land acquisition. The least expensive of the options is to build an overpass with sloped ground. This would be very similar to the Brilowski Rd (Cty R) overpass of the railroad about a mile east of Hoover. Due to the location of a few nearby businesses, this option will still require a retaining wall on the west side of the overpass to the south of the railroad tracks. The city has signaled that this least expensive option, estimated at $12.3 million, is probably the only option the city can feasibly afford. The span of the project along Hoover Road would be just under a half-mile, and the overpass would be approximately 27 feet high. That half-mile span covers a distance from around Industrial Park Dr to Carols Ln. All the options will also create a minor change in the alignment of Hoover Ave in this area. Travelling from the south, Hoover currently shifts slightly west near Joerns Dr before crossing the railroad tracks. In each of the proposed options, Hoover will continue straight to head over or under the tracks and will then shift slightly west to the north of the tracks to align with the continuation on Country Club Dr.
Bicycling and walking accommodations were part of each of the designs. I will focus my comments on specifics of the overpass with sloped ground design, but the other designs are similar. The roadway surface will have 2 standard 11’ travel lanes in each direction and a 5’ bike lane in each direction. On the west side of the overpass, there is a 5’ sidewalk plus 2.5’ of boulevard separation from the curb. On the east side of the overpass, there is a multi-use path (MUP) that is 10-14’ wide. The overpass design will block access to Joerns Dr from Hoover Ave. The current MUP on the east side of Hoover Ave that connects the Industrial Park Dr intersection to Joerns Dr will angle eastward in the new design to connect to the new cul-de-sac at the west end of Joerns Dr. Nothing in the new design affects the currently awkward movement for bicycle riders connecting from Industrial Park Rd across the Hoover Ave intersection to that MUP. There are a couple of key inadequacies in the bicycle accommodations for the overpass with sloped ground design. I will briefly outline these here. I submitted a letter to project staff that goes into more detail about these inadequacies and how to address them. Poky Pedalers can read those more detailed comments here. The biggest issue is the placement of the MUP on the east side the overpass instead of on the west side. Stevens Point Mayor Andrew Halverson made a comment at the meeting that there is a strong possibility in the future that the city will want to extend a MUP on the west side of Country Club Dr all the way up to Main St/Hwy 10. Such a MUP would connect with the MUP on the south side of Main St that runs along Iverson Park. If the mayor’s vision for an MUP along Country Club Dr comes to pass, a 5.3-mile direct path separated from traffic could be made available for bicycle travel from Main St/Hwy 10 to the Pacawa Park area of Plover. Opportunities to build such a long direct route for bicycles separated from traffic with relatively few street and driveway crossings are incredibly rare. This vision can happen, but only if the new Hoover design places the MUP on the west side of the overpass. Otherwise, two crossings across busy Hoover Ave within a half mile of each other would interrupt this otherwise excellent separated path. In my letter to project staff, I explain how the MUP can be placed on the west side of the overpass while also providing a good connection to Joerns Rd via a ramp along the retaining wall (this wall is required even in the sloped ground design) and an underpass similar to the current underpass MUP under I-39 about a half-mile to the east. The other major issue is the lack of a meaningful buffer separating the proposed bike lanes from the nearest standard travel lanes. The speed limit is expected to be 35 MPH, and common experience on the Brilowski overpass suggests that most traffic is likely to travel well in excess of this speed. Having only a paint stripe to buffer the bike lanes from this fast moving traffic is inadequate. And on the uphill portion of the overpass, the lack of a meaningful buffer is irresponsible. A 3’ no-drive buffer should be placed between each bike lane and the nearest standard travel lane in order to create a reasonable comfort level for those in traveling in the bike lanes. My letter to project staff also asks for such a buffer to be included in the overpass design. I encourage Poky Pedalers to learn about the Hoover project and to submit comments to project staff. One suggestion is to read the letter I submitted to project staff asking for changes to the proposed bicycle accommodations. If you like what I wrote, you can write a letter in support of my comments. In particular, if you like the idea of having the MUP on the west side of the overpass to enable the eventual creation of an excellent 5.3-mile separated path along the west side of Hoover Ave/Country Club Dr, then I hope you express this preference to project staff. A MUP on the east side of the overpass would be, in my opinion, an egregious engineering error and a lost opportunity for building something great for bicycling and walking. The more that project staff hears that the MUP is best positioned on the west side of the overpass, the more likely it is that this will become reality. I expect the city to hold another public meeting after they make a decision about their preferred option and after consideration of comments received. I did not hear an expected time frame for when such a meeting might occur. I will keep Poky Pedalers informed about this project as it moves forward. One way to stay up-to-date is to check out the Hoover Road Rail Grade Separation Project page under the Speak Your Poky menu. I’ll use that page to keep you aware of opportunities to voice your opinions to project staff. All roadway projects are opportunities to improve bicycling in our area. This Hoover project is no exception. I ask Poky Pedalers to Speak Your Poky to ensure quality bicycle accommodations are built on this project.